In a smartwatch market challenged by low demand and new product release timing, Apple continues to hold the top spot for quarterly sales in the segment, despite not shipping the Series 1 and 2 until the last two weeks of the reporting period. According to research firm IDC, in the third quarter all smartwatch vendors combined shipped 2.7 million units —just 48.4 percent of the year-ago quarter. Apple held 41.3 percent of sales, coming in at 1.1 million units. 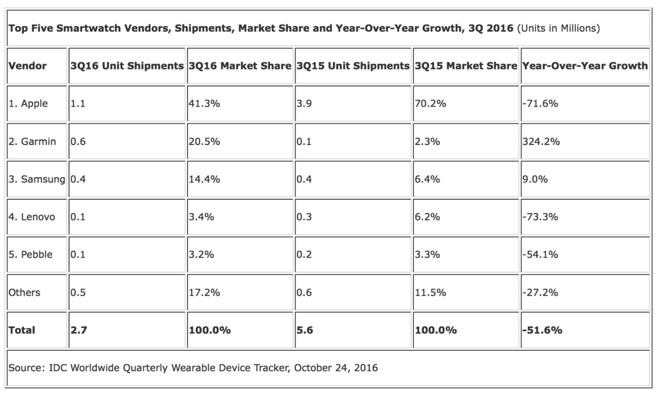 Garmin held the second spot with around 600,000 units shipped, and Samsung placed third at 400,000. The data has limited impact from the Apple Watch Series 1 and 2, or discounted sales of the original Apple Watch. The market may also be hamstrung by Google not releasing Android Wear 2.0 as of yet. In the third quarter of 2015, Apple sold around 3.9 million Apple watches, even with limited retail availability at the time. "Apple revealed a new look and feel to watchOS that did not arrive until the launch of the second generation watch at the end of September," said IDC. "Google's decision to hold back Android Wear 2.0 has repercussions for its OEM partners as to whether to launch devices before or after the holidays. Samsung's Gear S3 ... has yet to be released. Collectively, this left vendors relying on older, aging devices to satisfy customers." According to release day statistics, a sizable chunk of Apple Watch Series 2 pre-orders went to customers who own the original Apple Watch, while millennials replaced Gen-X as the largest buyer demographic. Millennials were the largest pre-order group over the four-day sample period, accounting for 39 percent of initial Series 2 purchases. Women accounted for 26 percent of pre-orders of the 2016 Apple Watch lineup, up from 20 percent with the original Apple Watch. 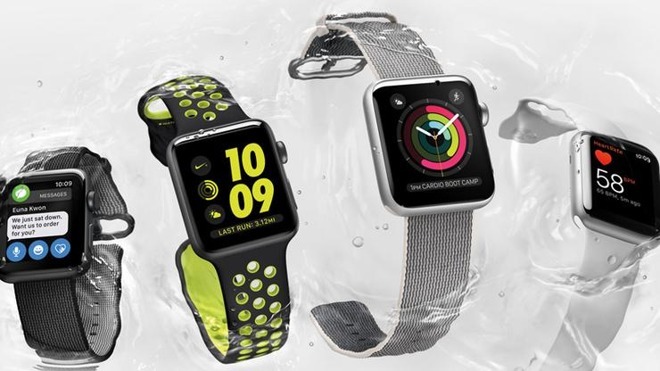 Early adopters appear to be gravitating toward larger Series 2 model, with 66.6 percent of buyers opting for the 42mm version instead of 38mm variants. Apple announced Apple Watch Series 2 at a special event in September. The wearable is externally similar to its predecessor, but contains internal improvements including a faster dual-core processor, GPS radio, brighter display, larger battery, and water resistance down to 50 meters. For the latest pricing and current availability on Apple Watch Series 2 models, please visit our Apple Watch Price Guide.